Opinions and advisories on Portland’s new cruise-ship greeter, York Beach’s most popular confectionery, and the correct way to say Sagadahoc. A National Park Up North? The debate is beginning to rage over whether Maine’s fabled North Woods should remain in private hands or be turned into a vast national park. By Jeff Clark. Only on an island like Matinicus would the local airfield masquerade as a jetport. Although their Mount Desert summer home was palatial in scale, the Rockefellers actually came to Seal Harbor each year to enjoy the simple life. By Ellen MacDonald Ward. Artist Linden Frederick has a spellbinding way of capturing the light that turns the mundane into the monumental. By Sarah Scott. The action at Maine swimming holes is all about getting into the water, not swimming in it. Photographs by Tonee Harbert. Bemard Etzel, of Farminglon, knows what he likes, and after some fifty years of gardening, he knows how to grow it. By Jane Lamb. You might see lobsters walking claw-in-claw at the Maine Lobster Festival, but don’t look for Mary Tyler Moore. Observations on a rite of summer by Christopher Corbett. Watching the surf at Ocean Point with his lover gave budding novelist Thomas Wolfe an invigorating respite from his personal tempests. By Steven B. Rogers. Why did Hazel and Joe Marcus decide to sell off the collection of rare antiques they spent fifty years acquiring? Edgar Allen Beem attended the epic two-day auction of their treasures to find out. Even with bifocals and incipient bursitis, I knew I still had a few more good ball games in me. A midlife reminiscence by David Morine. Some people are just born with star quality, as an old photograph of Ogunquit Beach lifeguards suggests. By Ellen MacDonald Ward. To sustain yourself on an island you must first adjust your thinking to the fact that a sovereignty is involved, that you are indeed cut off from the rest of the world with all that that implies. By Caskie Stinnett. 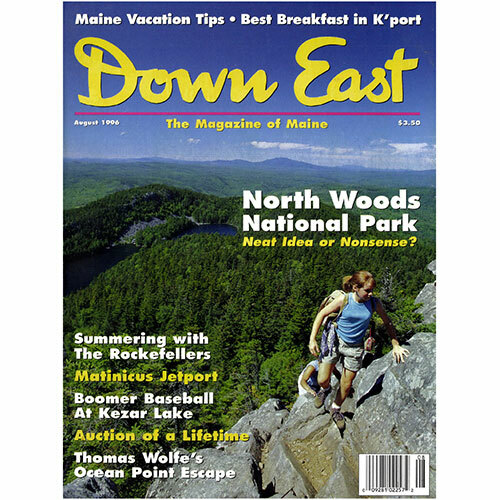 Cover: Climbing Borestone Mountain not far from Greenville, by Douglas Merriam.